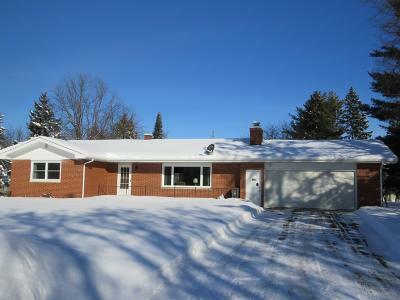 2+ bedroom/1.5+ bathroom ranch home that has been well maintained throughout the years and is sitting on a full acre in the City of Antigo! This home boasts of a kitchen full of oak Featherstone cupboards with beautiful crown molding, dining area with sliding patio door leading to the large deck with fenced in section of the yard. First floor of the home also features a large living room with wood burning fireplace and large picture window allowing a lot of natural light, a large master bedroom with 2 closets, full bathroom, and a nice sized 2nd bedroom with access to the 1/2 bath. The basement has a large den/rec room that could be easily made into more bedrooms if you added egress windows. There is a 2 car attached garage that is insulated, black topped driveway, as well as a garden shed. Radon mitigation in basement has been installed and a reverse osmosis system on kitchen sink. Call today for your appointment to view, you won&apos;t be disappointed!